Lawmakers let districts set their goals for teachers, so the majority have earned the top two ratings. Last year nearly every Florida teacher was meeting goals according to statewide teacher evaluation that includes student test scores. But that could change soon at Thursday's State Board of Education meeting. The ratings are important because they influence teacher pay and can determine which teachers remain in their jobs and which teachers require extra training. When Florida lawmakers first required school districts to judge teachers based on student test scores in 2011, lawmakers let school districts set the goals for their teachers. 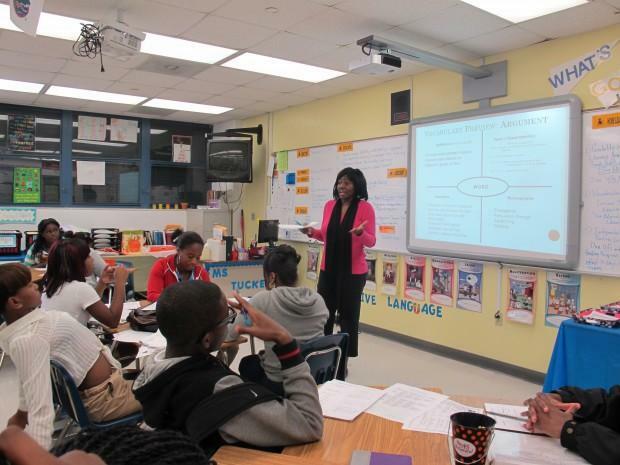 It’s why the overwhelming majority of Florida teachers earn the top two ratings -- “effective” and “highly effective.” Districts said they deliberately set lenient goals to let teachers adjust to the new evaluation system. But at Wednesday’s meeting, the State Board of Education will discuss setting new goals for teachers. Districts say it’s unclear how the proposed changes would affect ratings. a. Highly Effective: A highly effective rating on Performance of Students criteria is demonstrated by a value-added score of greater than zero (0), where all of the scores contained within the associated 95-percent confidence interval also lie above zero (0). III. A value-added score of less than zero (0), where some portion of the range of scores associated with both the 68-percent and the 95-percent confidence interval lies at or above zero (0). c. Needs Improvement: or Developing if the teacher has been teaching for fewer than three (3) years. A needs improvement or developing rating on Performance of Students criteria is demonstrated by a value-added score that is less than zero (0), where the entire 68-percent confidence interval falls below zero (0), but where a portion of the 95-percent confidence interval lies above zero (0). d. Unsatisfactory: An unsatisfactory rating on Performance of Students criteria is demonstrated by a value-added score of less than zero (0), where all of the scores contained within the 95-percent confidence interval also lie below zero (0). The new evaluations goals would only apply to teachers in subjects with a state exam -- such as elementary math, language arts or Algebra. Earlier this year lawmakers reduced the influence of test scores on evaluations. Instead of making up half of a teacher’s rating, test results can now count as little as one-third of a teacher’s rating. Copyright 2015 WLRN-FM. To see more, visit http://www.wlrn.org/.